WASHINGTON (WPVI) -- A midnight tweet from President Donald Trump has social media trying to find a meaning in the mysterious term "covfefe." 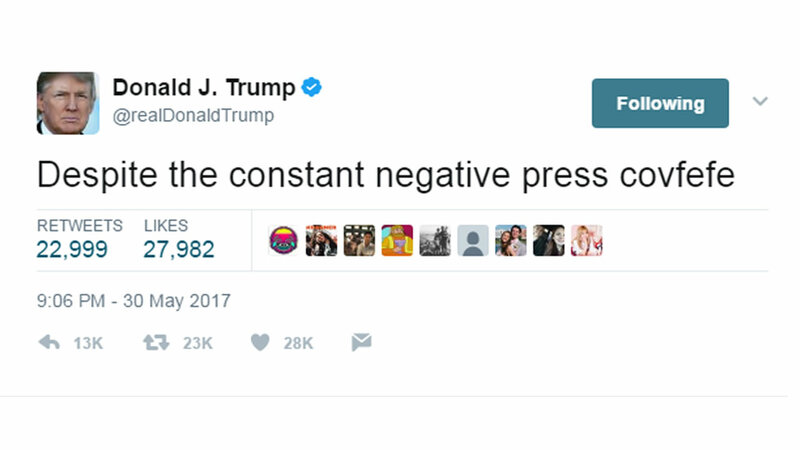 Trump tweeted just after midnight Eastern time on Wednesday: "Despite the constant negative press covfefe." The tweet immediately went viral and became one of the president's more popular posts before it was taken down after nearly six hours online. Trump poked fun at the typo, tweeting around 6 a.m., "Who can figure out the true meaning of "covfefe" -? Enjoy!" The term became a top trending item on Twitter, with many users supplying tongue-in-cheek meanings. Dictionary publisher Merriam-Webster checked in with an eye-rolling tweet about people looking up "covfefe" on its website. Dozens of definitions have been submitted the Urban Dictionary website, which crowdsources meanings for slang terms. One user joked that "covfefe" is already a popular name for babies in states that voted for Trump. Silicon Valley executive Andrew Crow went as far to change his last name on Twitter to "Covfefe." The president returned to his normal Twitter routine later in the morning by slamming Democrats over the probe into Russia's meddling in the 2016 election.